As music fans from Albania to Zambia prepare to celebrate International Jazz Day on Sunday, a pair of long-standing Moncton musicians are throwing their own party at Aberdeen Cultural Centre. Jamie Colpitts and Roland Bourgeois will be celebrating the release of Blue Monkton, a collection of jazz standards, a Thelonious Monk cover (from whom the album title draws its inspiration) along with the works of Irving Berlin, Antonio Carlos Jobim and others. 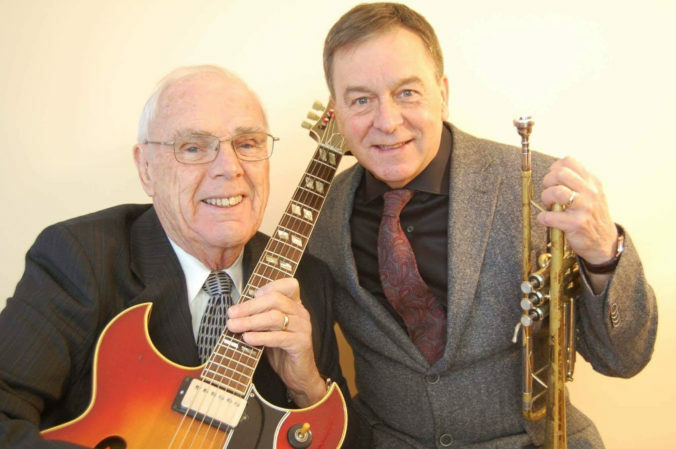 The friendship between the two musicians dates back to the early 80’s, when both were members of Jazz Generation, which used to routinely pack audiences into the basement of the former Cosmo Nightclub, where the Tide & Boar is currently located. The group would hold court there every Friday night for an astounding 22 years. “What was special about Jazz Generation is that it was a group of guys playing music for the love of doing so, and nothing else,” Colpitts recalls. At 85 years of age, Colpitts is unquestionably one of the most senior performers in the local music scene. He got his start playing with the 15-piece Pat Patterson Big Band in 1949, before joining forces with Amos Landry’s band in 1953. Fast forward more than 35 years to the late 80’s and the coming together of Jazz Generation. Colpitts and Bourgeois hit it off as bandmates, and often find themselves jamming together while waiting for the remainder of the group to return to the stage from break. The two worked so well together that it only made sense they would continue making music as a duo following the end of Jazz Generation’s long-standing engagement in 2010. After more than three decades of teaching music in Moncton-area schools, Bourgeois finally retired in 2013. Following the release of his solo debut in the spring of 2015, he and Colpitts decamped to Memramcook’s Monument Lefebvre where, with producer Francois Emond, the duo recorded Blue Monkton over a period of just three days. “We recorded approximately 180 minutes of music live off the floor,” Bourgeois recalls, noting that with the exception of one song, everything else was captured on first take. Eventually, the duo pared down the recordings to 10 songs or approximately one hour of music, for Blue Monkton. Bourgeois considers the album release a way to honour the incredible legacy that his musical partner has created over the course of the last six decades. While Colpitts might not be a household name to everyone, Bourgeois insists he has rightfully commanded the respect of many who aspire to follow in his footsteps. When: Sunday April 30, 7 p.m.